As caregivers, we must give ourselves a break from the day-to-day responsibilities connected with it. Listed below are a few of the organizations available in Philadelphia to allow you the opportunity to take a break for a few hours or a few days to recharge yourself --- keep yourself healthy. 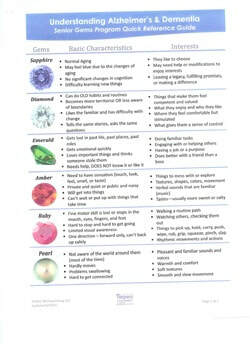 The Senior Gems gives you a visual of what stage in Alzheimers' your loved one may be experiencing. Take a look at this (click to make larger viewing) see if it helps you better understand why you're loved one does what they do. Maple Village at Center in the Park. Please take a moment to look at our web site www.journeys-way.org we are a resource for over 4000 people 55+ in NW Philadelphia and surrounding communities. Visit our beautiful new Center at Journey's Way and our new state of the art Adult Day Service Program -- providing a wide array of innovative resources and programs for Philadelphians 55+! you can learn what to do about it. At Nancy's House, we offer respite for caregivers, with a comfy bed for two nights of uninterrupted sleep, massage, and good meals. You and other caregivers will gather with trained professionals in a relaxed setting, with opportunities to practice gentle stretching exercise and to learn more stress management strategies to help keep you in good health. Respite retreats are held in beautiful and serene settings in suburban Philadelphia. Break the cycle of exhaustion and isolation. Please, come in and make yourself at home.